BACK IN A RADIO STUDIO! 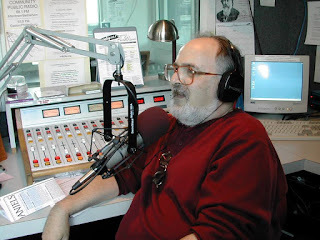 WDIY studio in the States taken a few years ago. I hook up with Wayne Allen, a local Brit musician, on Facebook. He's become involved with an English language, internet radio startup here in France. We meet. We chat. And before I know it, I'm spending a couple of hours in Wayne's little studio at the back of the garden recording a two-hour show of blues, jazz, Cajun, and zydeco music from Louisiana and Texas. I was told that the show would probably air next weekend. But I got a call from the station manager this evening at around 18h00 local telling me that I was about to go on. It seems that there were a pile of problems the first day. The stream went down. Presenters misrepresented their on-air chops. And he liked my work. So my two recorded hours went on air this evening and I've been asked to produce as many shows as I can to fill the schedule while things get sorted out. So we'll see what happens. When I know what's going on, you'll know. Meanwhile, all is in flux and what shows as playing on the website may not be what enters your ears.